Webmasters have to make sure that the code of their website is excaping several characters correctly. Failure to do so can lead to all kinds of problems from display errors to functions that are not working correctly because of this (check out The XML Page Cannot Be Displayed article for an example of things that can happen if characters are not escaped properly). The relevant characters that need to be escaped are &apos;, ", &, < and >. (I had to escape them while writing this article to avoid xml errors on the page. Webmasters have several options to escape these characters. They can escape them manually, use an online tool to convert them (see How To Display Valid Markup Code In Websites) or a software program like the XML Escape Tool. Source code has to be pasted into the first form field in the application window. 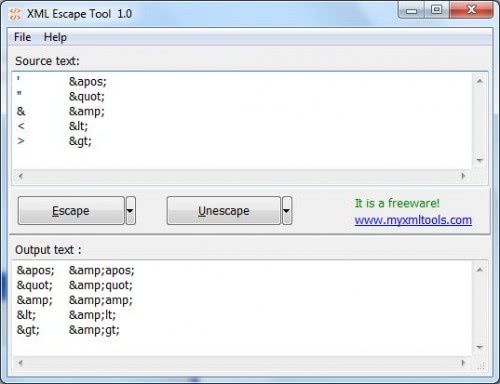 The tool can then escape the source code if the user clicks on the Escape button or unescape the source if the Unescape button is pressed. The resulting code can be copied automatically to the Windows clipboard. The benefit of using a desktop software program to escape the characters is that it works if no Internet connection is available. Users who want to try the software can download it from the developer's website.